The best website in the world will not rank well if Google cannot crawl, index and cache them correctly. While everything might render ok to a human visitor using a browser, there may be certain elements that Google may be blocked or restricted to assess. in this scenario, the website that is rendered for the users could be different from the website that is served to the search engines. If for example, the folder containing the CSS is blocked in the robots.txt this will stop Google adding styles to the page, and it will just render the plain HTML, the same applies to the images. If you read my techncial SEO case study you can see the effect that caching issues can have on a site. 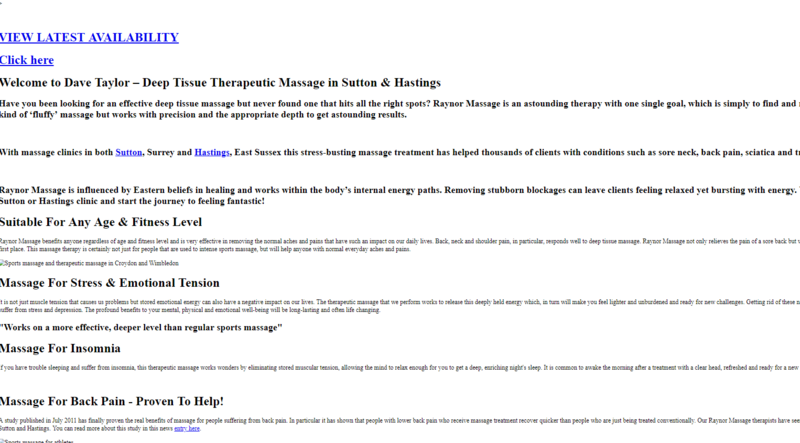 For example, the below screenshot is how this websites homepage renders in a broswer for a user. The following screenshot is how Google sees exaclty the same page. The images, styling, fonts, colours etc all all not visable. Google only sees the raw HTML. When Google crawls a website, it scans the HTML of the page, makes a copy of what it can see and downloads it and stores that download in it’s cache. This cached version is then stored in huge data centers. Imagine a massive filing cabinet containing copies of all the web pages in the world. If edits are made to a website, Google must crawl the pages again to see it reflected in its stored cached version. Google does not work off the live version of a website, it works off the cached version. If the cache version is broken, Google will think the website is broken. Google’s Search Console is a good place to find issues, however, it can produce a large number of false positives. It is worth checking all errors within the Search Console to make sure that you are not working with misleading or incorrect data. If a page is not being cached and rendered correctly this will usually result in mobile related errors within Search Conole such as “content wider then the screen”. This occurs when the CSS or JS files are not being loaded correctly and this, in turn, breaks a mobile optmised website. To find these arrors, naviagte to Google’s Search Console and select the property that you are working with. One the Search Console home screen the ‘Enhancements’ section should reveal any mobile realted issues. In the case below there are 7 errors. By clicking on the ‘Mobile Usability’ row on the ‘Enhancements’ table we can see the indivual errrors. Click into each one to extract the URLs. These URLs can then be collected to check in the following steps. The Google Mobile Testing Tool is good for checking indicual URLs to see if thaty are respoinsiove for mobiel devices. If a page is not being cached correctly it will flagged as none mobile responsive. However, the tool’s results should not be taken as the gospel truth. There is, what looks like, a timeout element to the testing tool. If the sites rendered HTML does not fully download to the tool within the allocated time frame then the results show a partly loaded and incomplete webpage. In the following example, the tested page shows a none mobiel responsive page with caching and rending issues in the Mobile Testing Tool. However, when the URL is manhually tested direclty in Google’s cache, the page is cachimng correctly. This is due to the site running slow, causing issues with the tool repdorting false psoitives. This being said, the Mobile Testing Tool is a useful tool in checking for content that is is not caching correctly. It is still worth double checking all the errors in Google Search Console in the tool to ensure that the errors that are being reported on are correct. Select the green downward arrow next to the URL and select ‘Cached’. This will show the rendered page from Google’s cache. Notice how even though the page looks like it belongs to my website, the URL is very different. This is how the page looks through a browser. In this example, the is nothing really that is an issue. So there is no action needed. A solution is only needed in the example below. Here is how the page is rendered to Google. The first action point ot check is to make sure that the data you are reocrding is correct by always double checking the cached version of the apge in teh SERPs. I would also recommend double-checking the date and time of the last crawl. This can be found in the top information bar of the cached version. The reasoning here is that the site could be suffering from crawl issues and therefore showing legacy caching issues. If the last cached date is longer than a month ago it may mean that the page needs to be crawled and indexed again. Google Cached Pages: What Are Cached Pages?